Dimensions: 12" x 1/2" x 1-1/2"
Dimensions: 8 1/2" x 14" x 2"
Slatwall special accessories are one of a kind attachments for Slatwall. Special accessories is a mixture of displays for different types of products. 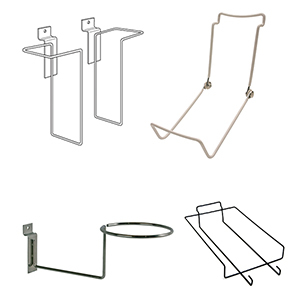 For example, hat/cap stores would be interested in our Single Hat Displayer, 10-cap Hat Displayer, or Slatwall Hooks. Our Single Hat Displayer can hold all types of headwear like baseball helmets, baseball caps, or berets and with its cushion, you don’t have to worry about creating a crease. Another Displayer, meant for balls, Single Ball or Hat Displayer can be used for hats as well as balls since it doesn’t have the cushion. However, it isn’t as strong so we don’t suggest placing helmets onto these Slatwall Special Accessories. Other retail stores selling or showcasing small products like smartphones, notebooks, or picture frames will be interested in our Adjustable Easels which are fitted for either Slatwall or Slatgrid. After finding the right special accessories, you will have to pick the color that best suits your store. American Retail Supply carries so many supplies that it can be difficult to find the right Slatwall Accessories for you. Thus, we suggest giving us a call to speak with our product experts because they have spent the most time getting familiar with ALL products. 1-800-426-5708.